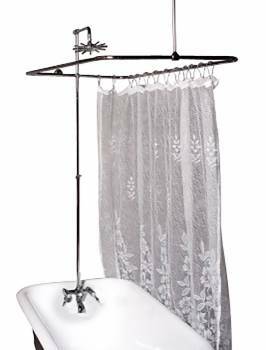 Our tub enclosure sets include a faucet, diverter, showerhead, riser & brace, to enhance your antique tub with a refreshing shower. Unlike many of our competitor’s enclosures, ours have anti-scald valves & anti-siphon vacuum breakers to meet all local codes. These features have established our tub enclosures as the standard for quality in the market. Free Shipping Seals the Deal! 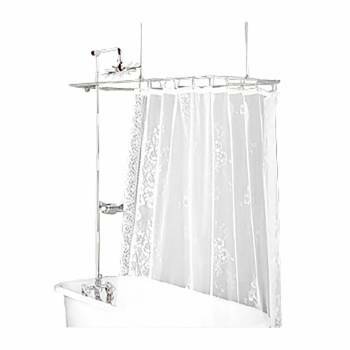 Shower Curtain Roller Rings, Shower Curtain Hooks. Glides smoothly, quietly & effortlessly along shower rods. Prevents tears in curtain liners. Imagine no more tugging at the shower curtain. Our ROLLER BALL Shower Rings have 6 BALL BEARINGS on the top to prevent SCRATCHING the rod. Unlike our competition that sells them with 5 or less ball bearings. Made of Antique Copper Plated Brass. Set of 30. Measures 2 3/4 in. H to fit standard shower curtain rods. 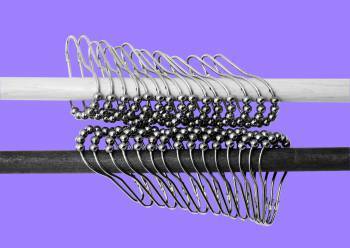 Shower Curtain Roller Rings, Shower Curtain Hooks. Glides smoothly, quietly & effortlessly along shower rods. Prevents tears in curtain liners. 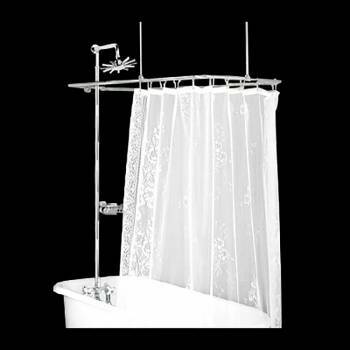 Imagine no more tugging at the shower curtain. Our ROLLER BALL Shower Rings have 6 BALL BEARINGS on the top to prevent SCRATCHING the rod. Unlike our competition that sells them with 5 or less ball bearings. Made of Nickel Plated BRASS. Set of 30. Measures 2 3/4 in. H to fit standard shower curtain rods. Item does not include shower head, riser, faucet or curtain. 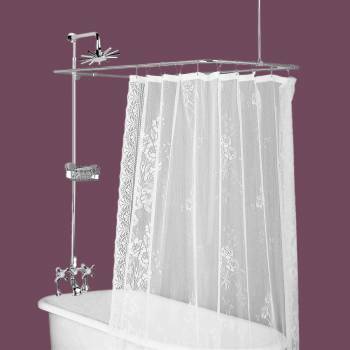 Shower enclosure measures 24 in. wide & 52 in. long, includes a 36 in. ceiling brace and a 16 in. wall brace. Deck-Mount: Complete your vintage bathroom. The faucet features classic, easy to grip levers and a diverter. Brass construction and chrome plating mean that this faucet will be around for long time. Includes a 38 in. ceiling brace and 16 in wall brace for sturdiness. 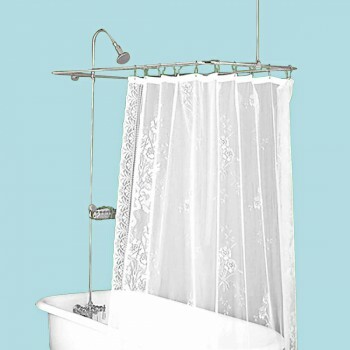 Riser shower adjusts in length from 33 1/2 to 61 inches. Luxurious Rainfall showerhead included. Deck Mount:Complete your vintage bathroom. The faucet features classic, easy to grip levers and a diverter. Brass construction and chrome plating mean that this faucet will be around for along time. Includes a 38 in. ceiling brace and 16 in wall brace for sturdiness. 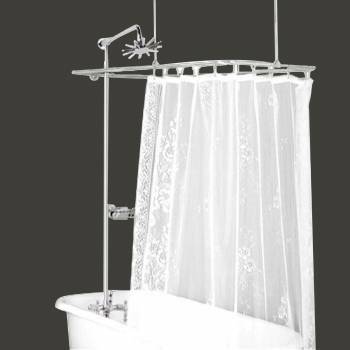 Riser shower adjusts in length from 33 1/2 to 61 inches. Luxurious Rainfall showerhead included. Deck-Mount: Complete your vintage bathroom! This faucet features classic porcelain cross handles & diverter lever. Faucets are labeled HOT & COLD. Brass construction with chrome plating mean that this faucet will be around for a long time. It includes a 38 in. ceiling brace and a 16 in. 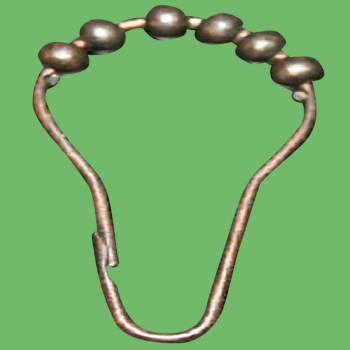 wall brace. 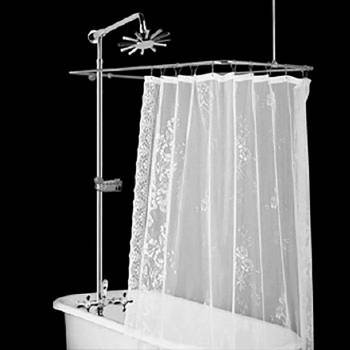 Riser shower adjusts in length from 33 1/2 to 61 inches. Luxurious Rainfall showerhead also included.